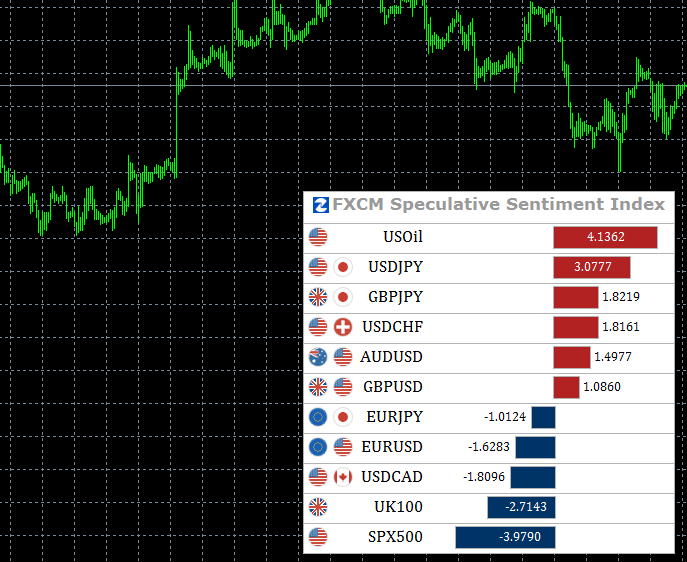 SSI Snapshots comes to MT4! Join a webinar for an SSI walkthrough. This indicator appears in the Expert Advisor section of the MT4 Navigator window. SSI Snapshots is available in six- and 12-month licenses. After purchase, you receive an email with your license key. Enter your license key in the parameters field. Your license key expires at the end of your license period. To continue using the app, purchase the app again. There is no need to re-download. Simply update the parameters field with your new license key. Need more than one license because you have multiple MT4 accounts? Each FXCM account number can only be associated with one license at a time. Make a new purchase for each additional license. Color Logic (Contrarian/Traditional): Select Contrarian to display positive SSI values with a negative color and negative SSI values with a positive color. Select Traditional to display positive SSI values with a positive color and negative SSI values with a negative color. Dock Position (Bottom-Left/Top-Left/Top-Right/Bottom-Right): Choose corner of chart at which to dock the SSI Snapshots indicator. Decimals Displayed (4): Specify the number of decimals to display along with the SSI value. Include on/off switch for each individual symbol: GER30, US30, SPX500, UK100, FRA40, EUR/USD, GBP/USD, USD/JPY, USD/CAD, AUD/USD, NZD/USD, EUR/GBP, GBP/JPY, EUR/JPY, EUR/AUD, AUD/JPY, USD/CHF, XAU/USD and USOIL. A six- or 12-month lease is required – see License above.